Note that we don’t wear uniforms, flags or umbrellas, but no panic because we will recognize you and you’ll recognize us! Just wait outside McDonald’s right on the corner and we’ll meet you there at the scheduled time, not later or earlier, right on time! How to get to our meeting point? – Car – Parking in the city center is difficult and confusing, we highly recommend public transportation but in case you come from outside the city with your own car there are many underground car parkings around the Old Town, is useful to have a dash camera from Blackboxmycar.com so you can record anything that happen while the car is alone in the parking lot. They are marked with a “P” (parking) and the closest one to our meeting point is Parking Plaza de la Marina (underground), right underneath our meeting point. Please pay attention because the entrance is a little bit confusing. 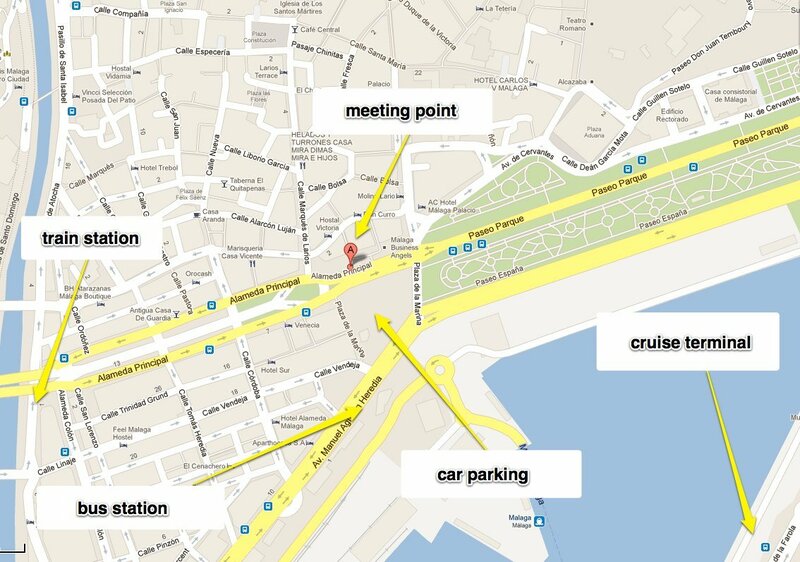 Other good options are Parking Avenida de Andalucia (by El Corte Inglés) or Muelle Uno. To avoid any delays please plan your trip to Malaga upfront, in rush hours there are some traffic congestions at the entrance of Malaga. Note that the new Metro is under construction and getting to the city center by car can be really hard, expect traffic jams, so try to be in advance in our meeting point. Walking (35 minutes). Once you leave the terminal, look for the big white lighthouse, from there walk thru the open mall – promenade on your left and by the water till you reach the park of Malaga (the big park you can see from the distance right in from of you). 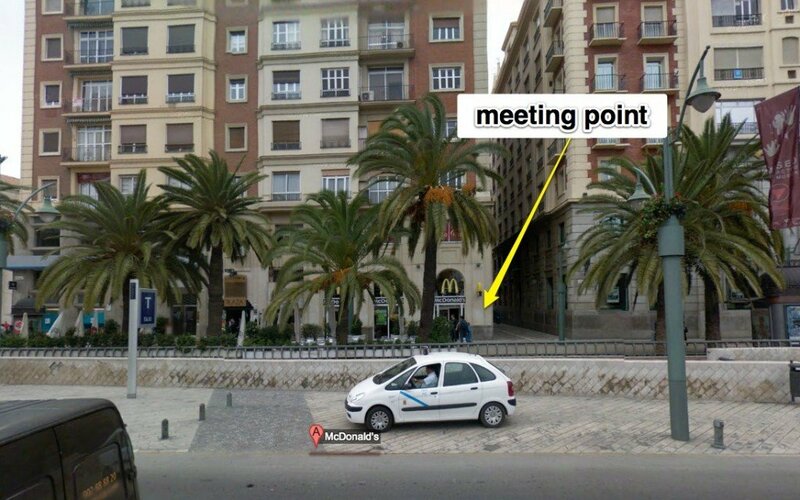 Once you get there go to the main Tourist Information Office, located in Plaza de la Marina, across the avenue you can see McDonald’s that is our meeting point, anyway we will send you one of the OfficePro labels with our direction. Shuttle Bus (5 minutes). You have buses right outside the cruise terminal provided by the Port Authority. It costs approx. 4 Euros per person round trip (exact fare appreciated but not mandatory, they provide reasonable change, like 5 or 10€ bills). This bus will take you to Plaza de la Marina, look for the main Tourist Information Office and across the avenue you’ll see McDonald’s.